In the quest to get richer, food companies go that extra mile to ensure their product is perceived as the best available option. Tricks of the trade. Initially, it was all about flavour and greasiness, but with more and more people becoming health conscious, they had to revamp their approach. There came in a gazillion “health foods”, or so we thought. Products are packaged with pretty words like low-fat, organic, sugar-free etc., which make us believe that we’re “eating clean”. When in reality, we’re not. These are mostly marketing gimmicks. You’re super healthy, or at least trying to be. You check the ingredient list on a food item before purchasing it. Amazing. It says 30 g common table sugar and you instantly keep it back. Now you come across another food item, which reads 10g raw sugar, 10 g honey and 10g fructose. There’s no regular sugar! So, it’s got to be healthy right? It has the word raw in it. Unfortunately not. Honey, fructose and raw sugar are all pseudonyms for the eternal “evil nutrient”. So, although broken down, there are still a total of 30 g of sugar in it. 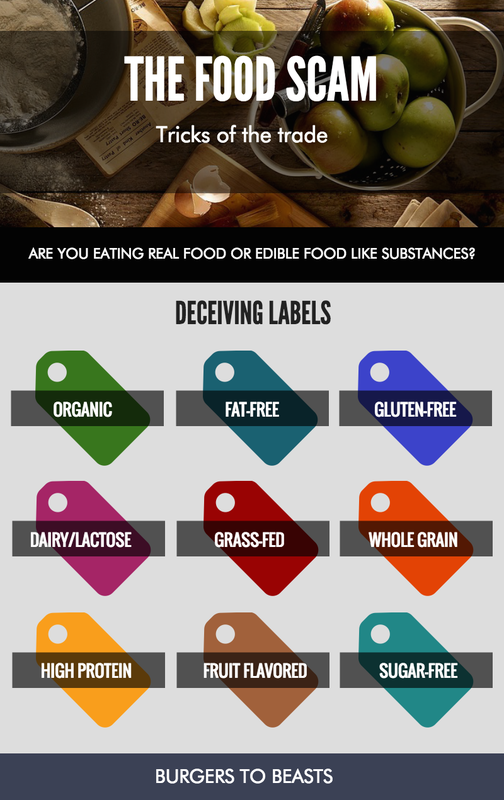 Food manufacturers often break down the ingredients and disguise the contents under other aliases to give you the feeling that you’re eating healthy. Organic equals natural, natural equals healthy. Yes. These super expensive foods are made/grown without the use of pesticides, fertilizers and GMO’s (Genetically Modified Organisms). Organic Ingredients-Almost 70% are natural, 30% aren’t. So as you can see organic doesn’t always mean healthy. Organic cakes still contain sugar and saturated fat, which translate to empty calories. The bottom line being, eat real food. First things first, fat is not your enemy. These days everything is low fat. We see a product with these buzzwords and purchase them blindly. Again, we may just be getting played. When products are made “low-fat”, several additives mainly sugars under some pseudonyms are added to improve the shelf life and taste. At the risk of sounding like a broken record, the sugars will cause an upheaval in blood glucose levels. In that zone, it’s practically impossible to burn fat. So the very purpose to consume low fat products is pretty much negated. The newest trend. Gluten is the protein composite found in most grains like wheat, rye, barley etc. In the recent past, individuals diagnosed with celiac disease/those with intolerance towards gluten, blamed this compound for their problems. Obviously, food companies responded with “healthier” versions of their products labeled “gluten-free”. However, a simple label slapped across a pretty package, doesn’t necessarily mean the food item is healthy. Gluten free muffins are still muffins. It doesn’t mean the product is free of other unhealthy additives. Long story short, unless you’re gluten-intolerant, try adopting a diet that’s actually sustainable and isn’t too heavy on your wallet. These days cows are raised in over crowded farms. They’re force fed to make them fatter. Consequently they get sick and have to be fed a range of antibiotics, if not hormones to keep them healthy. Then there’s organic milk, which claims to be free of these additives. The health benefits between the two are minimal, to be honest. Even skimmed milk, although lower in calories and fat may not be as healthy as you think it is. For starters, you absorb fewer nutrients without the fat in the milk. Then there’s added to sugar, to enhance taste. Reduced-fat foods and drinks may not be as filling, so you may end up compensating for the lack of calories by eating or drinking more. Back to the basics, cows were meant to eat grass. Unless specifically labeled as 100% grass-fed, chances are the animal was forced to eat something it wasn’t meant to like grains. Even then, more often than not the cows are raised indoors, with no opportunity to graze naturally. As mentioned earlier, they tend to fall sick and are fed a range of synthetic compounds. We’ve heard these one too many times, brown bread is better than white, whole wheat pasta is better than the regular kind and brown rice is healthier than white. There’s much debate to it. In reality you might just be giving yourself an equivalent of white bread with the addition of caramel colouring. If the label reads “wheat” or “enriched wheat”, that’s basically another name for white bread. White bread has become infamous, due to the manner in which it affects blood glucose levels negatively. I hate to break it to you, but caramel colouring is going to do just that. While whole wheat bread may be more nutritious in terms of fiber and micronutrients, the calories they pack are comparable (depending on size). However, at the end of the day they are both processed. The fewer ingredients on the ingredient list, the less processed the food will be. If you’re trying to eat healthy, there are a range of more nutritious carbs to supplement your diet with. However, if you’re adamant on consuming bread, look for a “whole grain” bread, NOT a “brown bread”. Ah..the bodybuilders delight. The health benefits of protein can’t be questioned. However, the source of protein largely affects it’s utilisation in the body. These days, with the rise of weight lifting, there has been a direct surge in the number of high protein products. We’ve all been there, in a hurry to grab a quick bite and a protein bar seems to be apt at the time. The problem with this is, that some bars contain about 30 g of sugar and meagrely 15 g of protein. Sounds like a candy bar? When you look closely, they don’t appear to be a health food at all. If at all you were to consume one, look for the one with the fewest ingredients and where the net carb content is lesser than the protein content. By giving you the taste of sweetness, without factoring in the calories, artificial sweeteners make you feel like you’ve found an effective way to lose weight. In truth, you end up sharpening your sweet tooth. Consequently you end up consuming more calories after. Basically, you shun healthy and nourishing foods for artificially flavoured foods with no nutritional value. Just because an item is labeled sugar free doesn’t mean it contains healthy ingredients. It could still contain a whole lot of other unhealthy ingredients and trans fats, which defeats the very purpose of going for a sugar substitute (unless you’re diabetic). Sounds healthy, right? Strawberry flavoured water tastes like, well, strawberries. That doesn’t mean there are actual strawberries in there. The sweet taste comes from sugar/sweetener and the fruit taste comes from chemicals that stimulate the same sensors in the mouth as strawberries. Just because a product has the taste of natural food, does not mean that there is even the slightest bit of that food in the product. You see a packet of cookies reading 100 kcal. You instinctively think it’s super low on calories, hence healthy. What you may have missed is the serving size. That may have just been 100 kcal per 100 g whereas the whole cookie is 200 g i.e 200 kcal. The next time you pick up a product, check out the “No. of servings” line in the Nutrition Facts box. You‘ll likely find some ridiculously high number there that has nothing to do with reality. The scam doesn’t even end there. If a single cookie contains less than 0.5 of trans fats, the manufacturers can claim it’s trans fat free. Whereas if there are 10 cookies in a box that’s actually 5 g of Trans Fats. Dam those loopholes. Brutal, but true. Make sure to check the number of servings on a label. Multiply the total sugar and calorie content by the number of servings to find the total amount in it.